ICIWaRM and UNESCO recently released a key guidebook on “Climate Risk Informed Decision Analysis”, or CRIDA, on October 23, 2018. The report is available at http://iciwarm.info/wp-content/uploads/2018/11/CRIDA_14-Nov-2018.pdf. 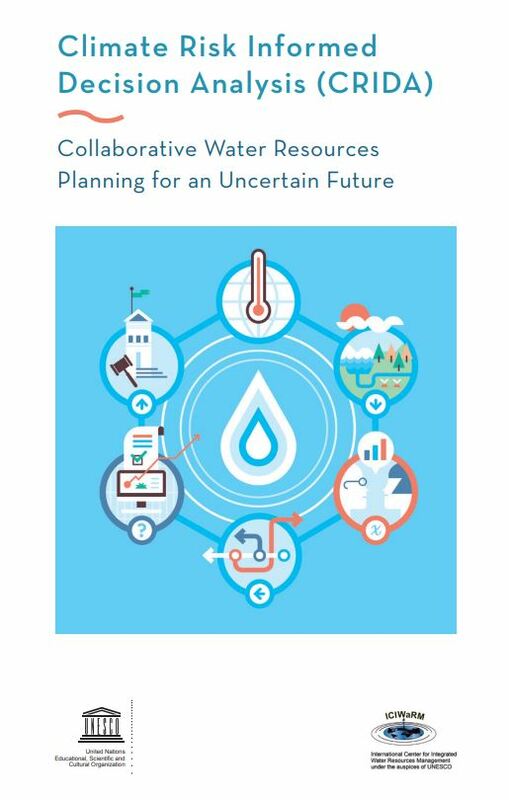 CRIDA provides bottom-up, stepwise planning guidance for water resources planners, managers, and engineers to include the uncertainties associated with climate change with other water management uncertainties, such as population growth, land-use change and urbanization. As the report notes, uncertainty is not a new issue for policymakers, engineers, or scientists working in water management. But the increasingly visible and potentially extreme impacts of climate change, and other difficult-to-predict drivers that stress water services, have highlighted the need to reassess how we address cascading uncertainties, caused by natural variability, model uncertainties, and decision-related uncertainties associated with public needs, objectives and values. Few examples exist of best practices for uncertainty in the planning and design of water resources management systems. Estimating future climate impacts has proven to be particularly contentious and frustrating, and in many cases effective solutions have depended on the skills and experience of a few individuals rather than systematic and reproducible approaches to planning. This guidebook focuses mainly on the early feasibility stages of project planning when vulnerabilities and future water demands are assessed and options are devised and formulated by practitioners and stakeholders in a collaborative setting for project investment decisions. It is often unclear at this stage which options are “best” — i.e., most cost-effective, resilient, or sustainable. The approach outlined in this guidebook applies standard engineering design criteria to feasible options recommended through a multi-stage and typically iterative planning process. Additional analytical and planning decisions are then made throughout the planning process by planners and stakeholders consistent with established planning procedures, agency protocols, and decision maker needs. In addition to ICIWaRM and its parent entity, the USACE Institute for Water Resources, the primary authors were from the Alliance for Global Water Adaptation (AGWA) and Climate Adaptation area of Deltares (Delft, The Netherlands). Much of the methodology was developed in collaboration with the Hydrosystems Group of the University of Massachusetts and the Global Water Practice of the World Bank.